Allen Crags is the highest point on the ridge that runs north from Esk Hause into the heart of Borrowdale, although it is overshadowed by the better known Glaramara at the northern end of the ridge. In its upper reaches Borrowdale splits into several valleys. The first to branch off is Langstrath, which runs between the Langdale fells and Borrowdale. The main part of the valley runs up to Seathwaite, then splits at Stockley Bridge, with the western branch running up to Sty Head and the central branch heading up Grains Gill. A sizable area of mountain landscape is found between Langstrath and Grains Gill, wider at its northern end and narrow at the Allen Crags end. The fell is thus is the form of a high point on a ridge, and fills the area between the 'false' Esk Hause and High House Tarn. The true Esk Hause is the col between Great End and Esk Pike, at the head of Eskdale. Huge numbers of walkers, coming onto the Scafell Pike range from Borrowdale and Great Langdale visit the true Esk Hause (although walkers from Borrowdale don't actually reach the Hause itself, and instead hit the slopes of Calf Cove just above it. The false Esk Hause is the highest point on the path from Sty Head to Great Langdale, and used to be a very busy junction. It is still visited by those climbing Scafell Pike from Great Langdale, but walkers from Sty Head now tend to take a short-cut that avoids this point. The 'False' Esk Hause is actually a pass between the two branches of Borrowdale that surround Allen Crags - Langstrath in the east and Grains Gill in the west. Allen Crags is normally climbed as part of the Glaramara ridge, so the main lines of approach are either along the ridge from the north, or up the path from the 'false' Esk Hause. The first route is for walkers from Borrowdale, and is a fairly steep climb on a good path through scree. The second could be used by some coming from Wasdale (via Sty Head) or Great Langdale (via Rossett Gill and Angle Tarn), and is an undulating path across a fairly chaotic ridge. Our ascent of Glaramara passes over Allen Crags. Allen Crags has a rocky but fairly level summit, surrounded by steep slopes in most directions, but with a more gentle slope heading north towards Glaramara. Allen Crags is bordered by Ruddy Gill to the south-west and west - the gill rises just below the false Esk Hause, runs west for a short distance then turns north to run down into Borrowdale. The northern boundary is marked by Allen Gill in the west, which flows down into Ruddy Gill and by a nameless stream in the east. 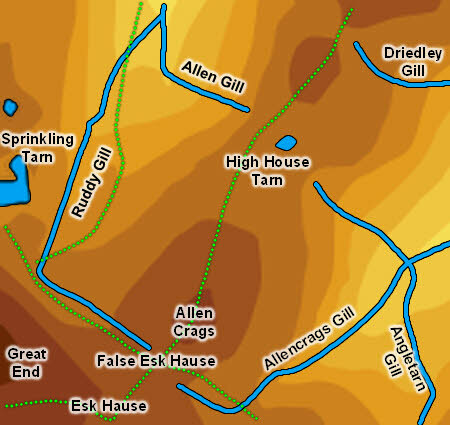 The eastern boundary is marked by Allencrags Gill, which combine with Angletarn Gill to form Langstrath Beck. Allen Crags is dotted with small tarns, mainly on the western slopes. The main tarns are on the northern ridge, where High House Tarn and the Lincomb Tarns are in the col between Allen Crags and the climb to Glaramara.